Outports, or outharbours as they are sometimes called, are literally ports other than the principal port of St. John's. They are usually small communities, although a few, such as Harbour Grace, achieved a substantial size as early as the 1830s. Generally the outport's main economic activity has been the fishery, although some have been based upon saw milling or other resources. Not surprisingly, given that the term “outport” applies to all but one of Newfoundland and Labrador's many coastal communities, they vary a great deal from one another. 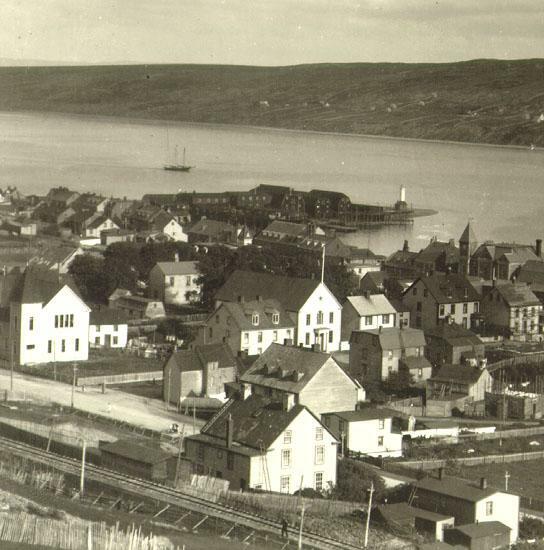 Harbour Grace continued to be one of the island's most important communities at the beginning of the 20th century. Courtesy of Archives and Special Collections (Coll - 75, 5.05.159), Memorial University of Newfoundland, St. John's, NL. Detail from a photo by R. T. Parsons. Outports were settled where families could get shelter, fresh water and access to the fishing grounds. Additional factors such as availability of shore space for the drying of salted fish, and timber for building and firewood, were also crucial in making some places desirable in which to live. When all the existing shore space became allocated, or when more productive fishing grounds became known, some people would move to other areas. These geographic and ecological factors account for the high number of small outports spread over the length of shoreline and hundreds of islands of Newfoundland and Labrador. The physical layout of outports varied with the local topography, but fishing outports had particular characteristics in common. Space along the shoreline was used for wharves, storage sheds and flakes for the drying of fish. Inland from that, houses and gardens were laid out to make full use of the available land. The public buildings included one or more churches and perhaps a school, and meeting halls for fraternal societies such as the Loyal Orange Lodge. Each outport would have at least one, and larger outports several merchants who would supply the fishing families. Besides the merchant, clergy and perhaps the school teacher, smaller outports would consist almost exclusively of fishing families. Larger outports might have a few artisans, such as blacksmiths or cobblers. A few outports became service and administrative centres for their areas, and such communities might include a customs officer, magistrate, doctor and postmaster. The relative wealth of outports varied, as did the income of fishing families within an outport. 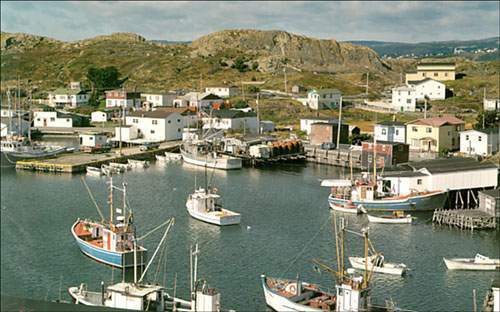 Outports on the Burin Peninsula, for example, were able to take part in the lucrative Banks' fishery and had higher per capita income than outports where fishing opportunities were restricted to the inshore fishery. Not all fishing families within an outport were equal. Some families would have had greater financial success, perhaps reflecting their having had the capital to invest in better gear or boats, or having inherited preferred locations for their gardens, wharves and storage sheds. Some successful fishing families might eventually become merchants and extend credit and supplies to others within their community. Other families might lose their independence after a poor season and have to work for a share of the catch on a boat owned by another family. People sometimes assume, without evidence or comparison with similar small communities, that outports were “isolated.” Communication between outports was difficult. Sea ice, for example, made travel between outports difficult during much of the year, and while a few had roads to other communities there were often only footpaths to neighbouring outports. But most residents of rural communities everywhere in the world travelled only short distances from their homes. During the age of sail, Newfoundland and Labrador outports were visited by ships from Europe and New England, while people a few miles from the coast in a farming community in Europe would have seen fewer travellers. Newfoundlanders travelled throughout the North Atlantic bringing fish to market. John Froude of Twillingate, for example, travelled to many countries in North and South America, Europe, Africa and Asia during the late 19th century and early 20th century. Isolation is relative, and outports were often less “isolated” from international connections than contemporary farming communities in the rest of North America. While farming communities were fixed in one place, many fishing communities moved from one outport to another during different times of the year. Since many fishing outports were on islands or exposed headlands, to be close to fishing grounds, they were inhospitable places to spend the winter. In some instances, all the families in a “community” would have two houses, one near the fishing ground and a second further in the bay where it was sheltered and firewood was available. These “communities” lived in two different geographic locations, at the bottom of the harbour during the winter and out on the islands during the summer. This pattern sometimes evolved into a migratory fishery. During the 19th century whole families spent the summer fishing on the coast of Labrador, and returned to Conception Bay for the winters. This pattern of having winter and summer houses declined as motor boats made distances to the fishing grounds less of an issue, and the migratory fishery from Conception Bay to Labrador declined in importance as the coast of Labrador became settled. Reproduced by permission of Ben Hansen ©1994. From Ben Hansen Newfoundland and Labrador, (St. John's, 1994), 18. In the 20th century, many of the “winter” outports at the bottom of bays developed a permanent population of their own as people turned to saw milling and cutting wood for paper companies. Communities that had the railway pass through them in the late 19th century, such as Gambo, also benefited from becoming service centres. Since government-owned steamers linked many centrally-located outports, these communities took on a greater importance in their areas. Some outports also depended upon shipping. Botwood, for example was the port through which the Grand Falls paper mill shipped its goods to market. While most outports relied upon the fishery for their economic life, the communities that grew up around woods work and transportation retained many of the characteristics of outport community and culture. One should be wary of generalizing from the experience of one outport and assuming this “outport culture” was the same in all communities. Smaller outports were often uniform in their Christian denomination, which sometimes meant that neighbouring outports consisted of people of different denominations. Outport cultural traditions varied, such as the Christmas Time visiting tradition of mummering, which would have included the consumption of alcohol in Roman Catholic but not in Methodist communities. While marriage partners would often come from another outport that shared the same denomination, this would less often be the case when nearby outports were Protestant and Roman Catholic. Larger communities, such as Harbour Grace, would have had both Roman Catholic and Protestant residents, but a measure of geographic as well as social separation between the denominations remained. Prior to the 20th century, most Newfoundland and Labrador outports, with the exception of a few other larger centres, lived without local government and with infrequent contact with representatives of the British or Newfoundland governments. This meant that disputes between people had to be often settled without appeal to courts or police. Generally the small size of these communities made it possible for a consensus to be reached about what was and was not appropriate behaviour. During the 20th century the government extended control over and services to these outports. Reproduced by permission of John de Visser ©1997. From Margaret McBurney and Mary Byers True Newfoundlanders: Early Homes and Families of Newfoundland and Labrador, (Boston, 1997), 130. The process of extending services to rural areas led to one of most controversial government policies of Newfoundland's recent history. The government of Joseph Smallwood balked at the prospect of providing services to hundreds of small communities. By concentrating these families in a smaller number of centres the government could provide services such as health care and education more cheaply. It also envisioned the foundation of new centralized communities, one of which was named Centreville for example, that would then provide a work force for the new manufacturing industries Smallwood hoped to establish. The Centralization Program and its successor, the Fisheries Household Resettlement Program, encouraged whole outports to pack their belongings and relocate by offering subsidies to those who chose to move. Government services were withdrawn from anyone who wanted to remain once the majority of the community had voted to leave. Between 1954 and 1972 more than 27,000 people and more than 220 communities were resettled. This proved to be a heart-rending experience for many of those who were resettled, and encouraged a romanticized image of life in the former communities by those who found themselves growing up in urban centres and listening to the stories of life before the move. 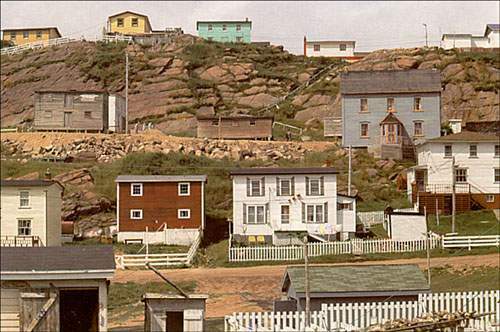 It is also worth noting that before and after the government program, rural communities in Newfoundland, as elsewhere in the world, continued to lose people to urban centres. Many unsettled outports would not have continued to exist even if no program had existed. The widespread feeling of decline in rural Newfoundland, which was matched in rural communities elsewhere in the world, reached a new level in 1992 when the Government of Canada placed a moratorium upon catching northern cod. Many once-thriving outports now had to find new resources upon which to employ their population. While the harvesting of new species, and new industries such as tourism, gave some outports hope, most experienced a rapid decline in population. Municipal governments faced declining tax bases and difficulties in attracting new employers to their communities. Since young people with children are leaving, the continued viability of many outports is threatened. Some outports will cease to exist and others will evolve, as has always happened.